The new OneStream 4.1 software is released in February. For us it’s always an exiting moment. What’s new? How would these new functions serve the needs of our clients? Are our change requests honored? Is installation still very easy? In this and the coming articles you will get the answers to these questions. This release of OneStream is upgrading the presentation layer with a lot of new features. The cubeview is a dominant building block in the software. It can be used for quick analysis, (structured) data entry and reports. The possibilities for cubeview reports presentation, have been extended to a next generation. In the screenshot you’ll see a cubeview report popup with conditional formatting on the better/worse column, dynamic formatting of the expanded time row T#Quarter(|PovTime|).Tree, formatting of derived data. This topic will be discussed in more in future articles. In addition to cubeviews, the so called dashboards are a very rich equipped way of interacting with the user. Although the word dashboards, might give the impression of a set of graphics only, the dashboards in OneStream are much more. The dashboards enable creation of user group tailored screens, showing status indicators, financial and non-financial information (any source), input screens, graphics, embedded websites and virtually anything to your imagination. The so called parameter components enable actions like consolidate, execute a business rule, open another screen or interaction with the workflow. In this already large list of components, a series of new 2D graphs (with a lot of customizable properties) have been added. In addition to the nice looks, all kind of actions can be triggered from within these components. Also the new geographic map components look very nice and have a lot of possibilities such as red/green indicators and custom pictures (will be described in next article). The model has been extended with a weekly option for the time dimension. Each cube in the application can now have its own set of dimensions including the weekly time dimension. Imagine your weekly cash forecast including a fully controlled workflow and still being able to compare to your monthly actuals. It’s now very easy to implement. The list of time members for use in member filters has been extended with week specific functions like T#MTD which shows the to date accumulation of weeks within a certain month. Also the number of months in a year can now be configured to be more than 12. As the number of periods in a year might become large, due to the use of weeks, the spreading function for manual data entry has been extended. Simply selecting the cells that need (re)population and select the spreading method like factor, even distribution or week specific methods will do the job. Also parent cells can be selected (e.g. quarter) to quickly spread the data. The scenarios have an option now, to exclude them from workflow POV selection. This is an option that is very welcome to clients using calculated scenarios. E.g. scenarios that take a number of actual periods and combine it with the latest forecast are then excluded from the workflow selection box which is a nice user friendliness enhancement. The extension of the scenario types is a good addition in terms of maintenance and performance. E.g. sustainability calculations might be quite different from monthly actuals calculations. Now the business rules can be attached to these types, eliminating the need for checking within the rules whether or not to apply the calculation. This is beneficial from both a maintenance as well as performance perspective. Since the introduction of version 4.0, the extract metadata option has a feature to select members being modified since a certain date or changed by a specific admin user. A great feature but it was a bit harder to select branches of metadata (E.g. only the cash flow hierarchy accounts). Therefore, AgiumEPM filed a change request to have an option to select all members under a parent. This request has been implemented by adding the option “(un)select all descendants” in the “select members to extract screen”. Together with the renewed metadata audit this a powerful feature to control development versus production environments. Not new but very useful is also the snippet editor. This option allows the admin to store frequently used code bits and fasten rules writing by reusing this code. 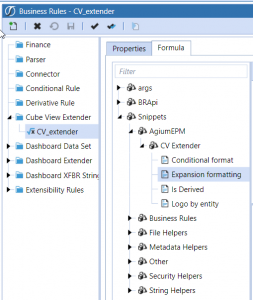 We already created a number of snippets for the new cube view reporting (CV Extender) business rules. Installation or upgrading of the OneStream software is never a big issue. Also this time the upgrade went smooth without any problems. Although the process is easy (just de-install and install the servers and reuse the settings files) it is a comfortable feeling to have a good upgrade guide. Also people without any IT knowledge can execute these steps. This version requires a SQL table schema upgrade but this is also just clicking an option in the OneStream database configuration utility. In less than an hour we successfully upgraded our test environment to the 4.1 software and converted seven applications and did some sanity checks. Also the Excel add-in and OneStream studio just prompts with a message that it needs an update and upgrades on the fly. No difficult instructions for end users anymore or weeks of support and fingers crossed like we see with other products but just go for it! In terms of performance we see some slight improvements in the consolidations of up to five percent but that depends a little bit what kind of calculations are executed. For tasks like importing data to stage, validate and load to cube we did see the same results comparing 4.01 versus 4.1. Disappointed? No, not at all, given the fantastic consolidation algorithm utilizing smart multi-threading already known from the previous versions, the system is already incredible fast in calculation/consolidation speed.